Rather than going to one of the old favorites again Robert and I were intrigued when his daughter Laura gave us a heads up about a new hot dog place in Avondale, Hot Diggity Dogs. I doubt if I ever would have spotted this place without reading about it before going there. It is located at is 430 41st Street South on the second floor above Fancy’s on Fifth in Avondale. The building is at the corner of 41st Street and 5th Avenue South, directly across the street from Avondale Park. 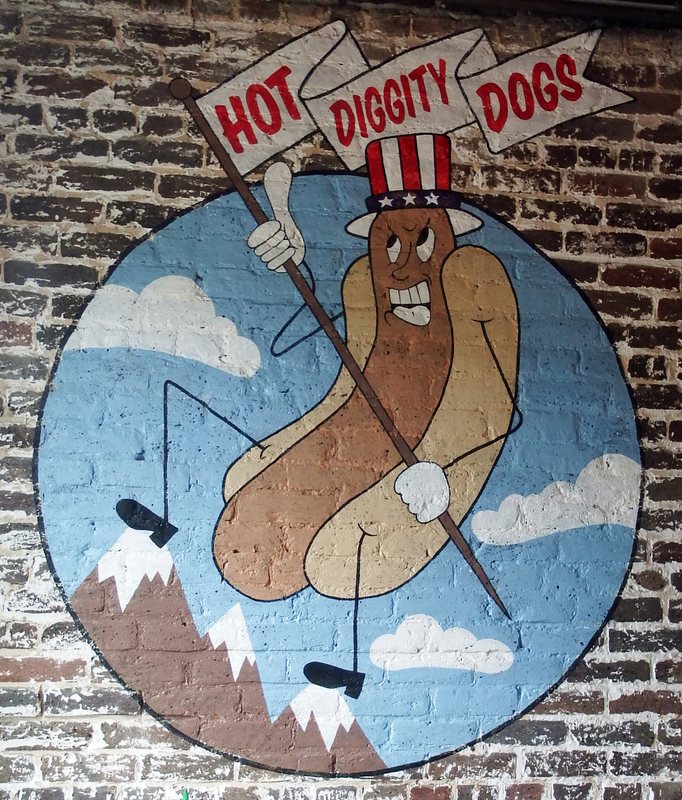 One enters Hot DiggityDogs through a door toward the rear of the building on the side facing Fifth Avenue South. So it seems that the front door for Fancy’s on Fifth is actually on 41st Street, and the door for Hot Diggity Dogs is actually on 5th Avenue. 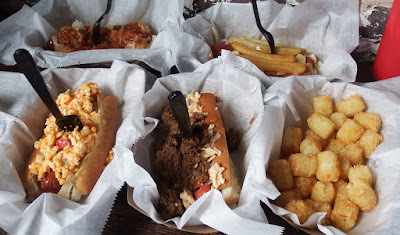 Fancy’s on Fifth, billed as “Oyster Dive – Burger Bar” in Avondale and Hot Diggity Dogs billed as “Hot Dog Joint” share the same building and street address. Avondale is an old neighborhood that has attracted lots of new food and drink servers in recent years and seems to be thriving. These two restaurants are located in a historic two story building that has been through a number of transformations over the years. I have noticed the building for decades and always liked the little arches on the windows and creative brick work on the front. I would love to know when the building was built and what it's first use was. When we were there it was raining so I didn't get any good photos of the exterior, but they can be found on their facebook pages linked above. We climbed the stairs to Hot Diggity Dogs and emerged into a smallish dining area with lots of counters and stools around an open area. There are several windows offering a nice view across 5th Avenue into Avondale Park and creating a bright atmosphere. But what about the hot dogs? We have always enjoyed finding unusual hot dogs and we certainly found some here. Of course the menu includes a “Birmingham Dog”, which is what we find at most hot dog joints around Birmingham; but there are also several other dogs that I don’t think you can find anywhere else around here. All of the dogs are large all-beef dogs that are hearty. 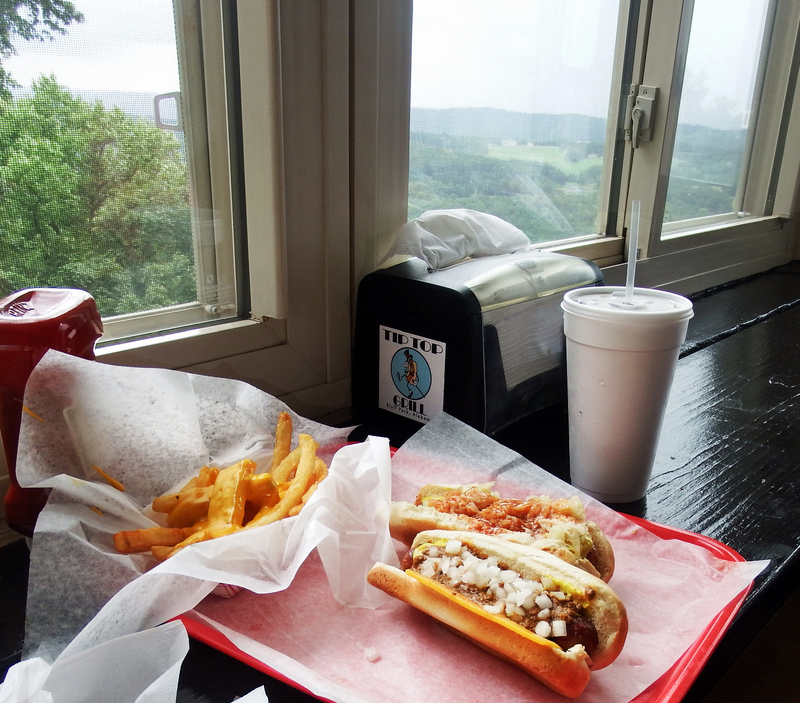 Winky Dink Dog:: Pimento cheese, mustard, onion. Sayonara Dog: Surimi salad, pickled ginger, seaweed relish. Oh Canadog! : Fries, cheese, gravy, onion. Deli Dog: Pastrami, kraut, Swiss cheese, Thousand Island dressing. 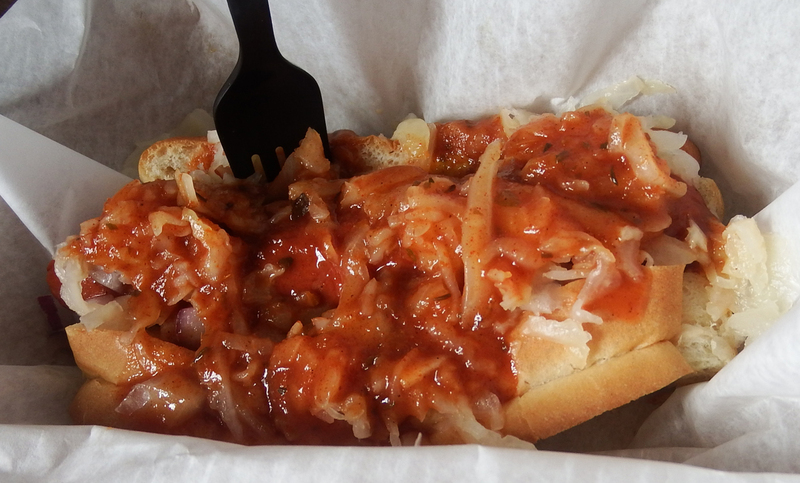 Birmingham Dog: Mustard, onion, kraut, sauce. The Motherload: Chili, mustard, onion, kraut, slaw. Emperor Gochujang: Gochujang slaw, pickled onion, Korean barbecue sauce. Waimea Dog: Spam and pineapple relish, sriracha mayo. Diablo Dog: Jalapeno, bacon, cheese, tortilla strips. Build Your Own Dog: Pick your toppings. Fries, tater tots and pork skins. They also serve "Grapico Ice Cream"
We took a couple of minutes to take it all in and ordered four different dogs planning to split them all between us so we could taste some of the unusual offerings. We settled on a “winky dink dog”, a “Birmingham dog”, a “The Motherload” [dog], and an "Oh Canadog!" with a side order of tots to split. The dogs all came on waxed paper lined cardboard serving trays. The first thing we noticed was that the dogs were filled so generously that we couldn't pick them up to eat. We resorted to using a fork and knife not just to split the dogs but also to eat them. I think my favorite from the four we ordered was the Winky Dink Dog. 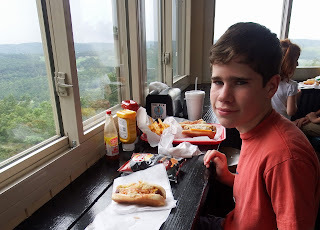 The slightly sharp pimento cheese along with mustard and onion on a hot dog was great. Robert’s first choice was the Motherload which positively overflowed with chili over mustard, onion, kraut, slaw and of course an all-beef dog. This dog was my second choice coming close to my first choice. It reminded me of a dog we once encountered which was called a "junk yard dog"
The Birmingham dog was a good large version of the dog usually encountered around here and was also very good. I guess it is also unusual given the size of the dog used and the abundant toppings. Then the “Oh Canadog!” (shown to the left) was something really different. 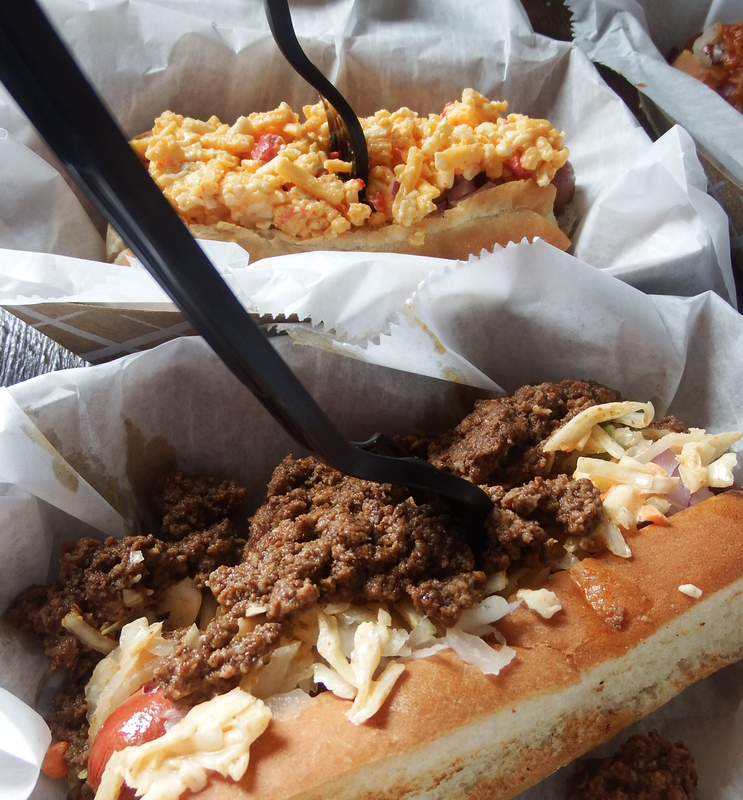 You may have noticed we didn’t venture to try some of the dogs with toppings we couldn’t pronounce. 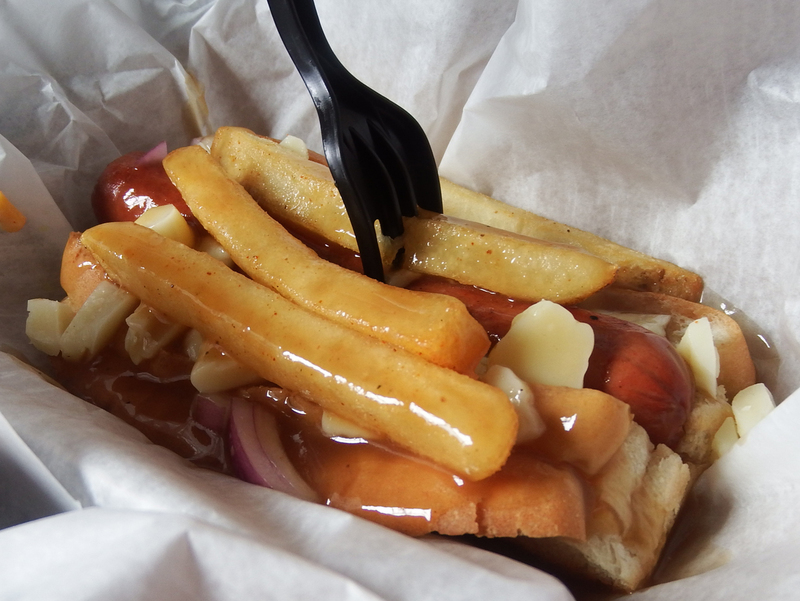 We were tempted to try the Diablo Dog, but Robert made the call to try the Oh Canadog which is topped with fries, cheese, gravy, and onion. I have never thought about topping a hot dog with gravy but it wasn’t bad, just different. Preparation takes a little longer than at your usual hot dog stand, but when served the dogs are fresh and worth the short wait. I will also comment that they are a little pricier than the usual hot dog but can accurately be labeled as gourmet hot dogs. All in all we enjoyed each one we tried. 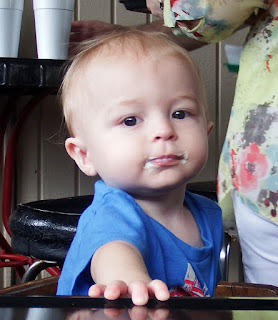 It would have been nice to try the Grapico ice cream, but we were just too full. 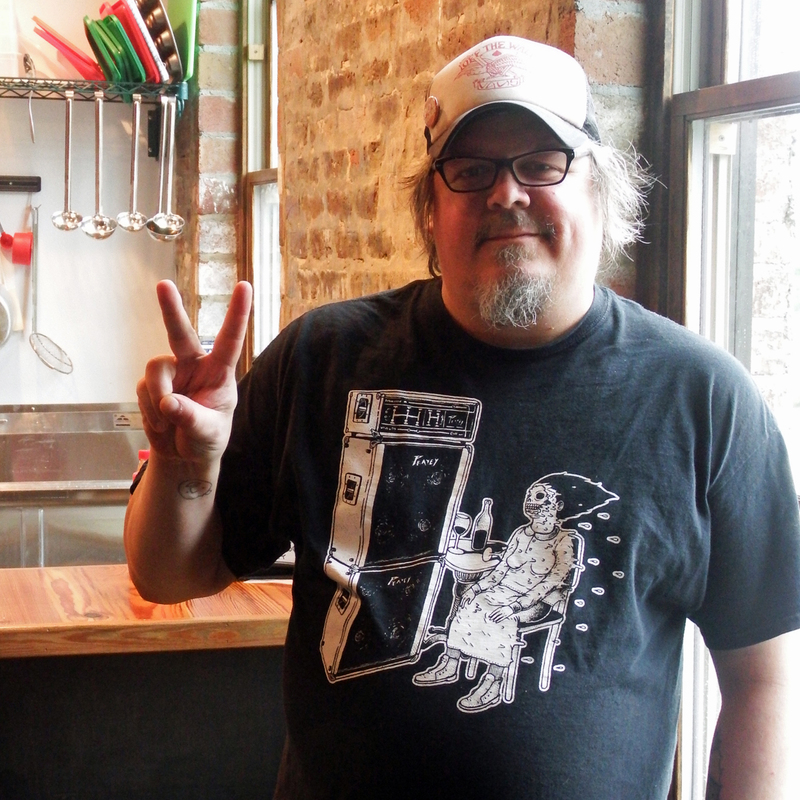 We spoke with chef Tom Bagby who is the general manager and came up with the creative menu. There is a nice interview with him from Weld for Birmingham at this link. 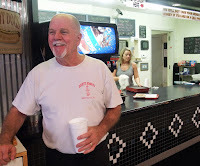 There is also a nice article about Hot Diggity Dogs on AL.com here. 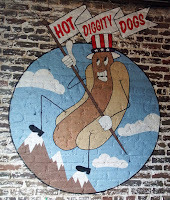 Hot Diggity Dogs seems to fit right into the eclectic style of repurposed buildings in Avondale. The creative menu will probably draw some customers who wouldn’t usually eat at a hot dog joint. They just need to spread the word. A few days ago we were keeping three grandchildren for a few days. 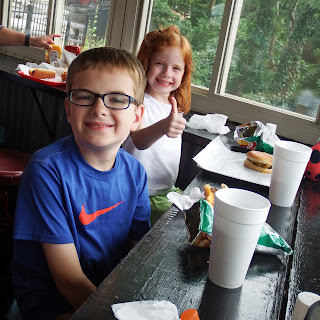 I had planned on taking them out for hot dogs one day for lunch and one thing started leading to another. Before long my wife, a daughter, and I were taking those three along with two more from another family to have lunch at TipTop Grill. So here we went, three adults and five kids aged from one to fourteen. I have always liked going to Tip Top Grill. They are located on the bluff in Bluff Park in a recycled gas station. Whenever I eat here, the view and breeze give me a sense of going on a vacation. 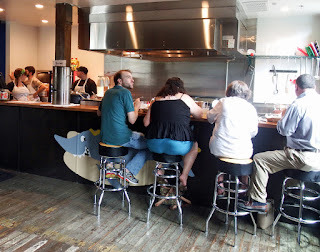 I think it’s an unusual environment that makes it a fun place to eat. Tip Top has lots of seating outside along the bluff, on the deck, or under the canopy in front. This day was a little overcast and we actually saw a little rain so we opted to eat in the dining room which I had never done before. The dining room is small but it can seat more people than I first thought when I saw it. With kids almost every order is special due to their likes, dislikes, and lack of a fully developed appreciation for good food. So everybody got their order as correctly as we could communicate it. First thing I heard as we were sitting down was the six year old redheaded granddaughter announce that there is a fantastic view. I agreed. So we distributed the food and had a good time eating together and socializing with other customers. No bashful kids here. Then as we were close to finishing up, in walked a long-time friend who was just stopping in for lunch. In my last post I talked about Jack joining me for lunch and now another friend named Jack walked in. This Jack and I have joked about what we might be able to pull off together. I agree with the comments Jack has heard for years, that he looks like Robin Williams; and I have been told how I look like Steven Spielberg, even by some who have met him. But we didn’t attempt any role-playing, we just ate and had a good time together. How was the food? I heard no complaints and I think if anything it is better than on previous visits. I liked it so much that I bought the tee-shirt. To eat we had hot dogs with a variety of toppings, chili dogs, chili cheese dogs, and slaw dogs. We even had one cheeseburger which was pronounced as great. A good time was had by all. It’s been a long time since I posted on this blog but here I am. Yesterday I was having lunch with a close friend, Jack, who works in the heart of the UAB medical center. He doesn’t have long for lunch so I picked him up as he walked out of the hospital and went directly to one of my favorite hot dog places, Scott’s Koneys. When we arrived I was pleased to find this establishment flourishing. 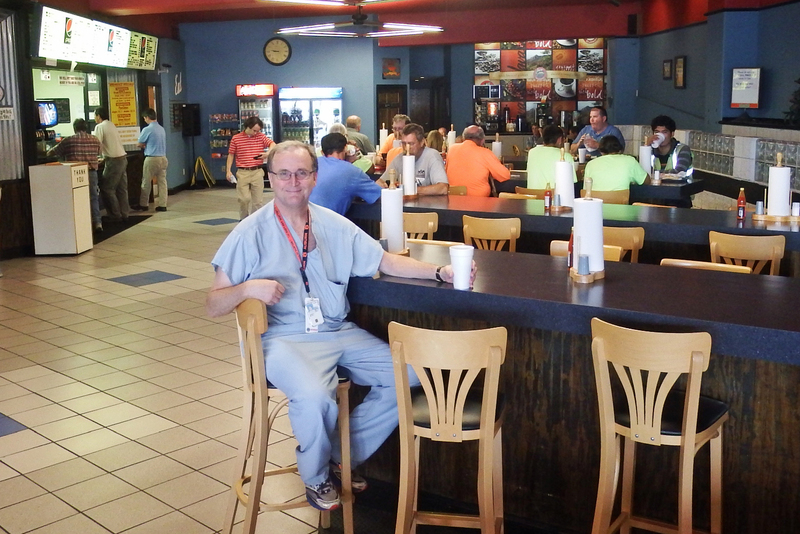 Scott’s has the biggest dining area of ANY hot dog stand in Birmingham. Since he is the sole survivor in what was once a food court attached to the old Liberty National Building he now has the entire seating area for his customers. Since he is in a parking deck he also will validate a parking ticket for free parking, what a deal. We walked in to find a crowd dining in the large dining area as well as more people working to serve customers than I had ever seen here. Scott was back in the cooking area but spotted us through the open windows and came out to talk as soon as our order was under way. He apparently has a good memory for faces and remembered talking with Robert and I on previous visits here and here. He was in good spirits due to the good business he is doing and the growing prospects for more. Now to the important part, the food: On my recommendation Jack and I each ordered a “smoked sausage dog” all the way. I must confess I also ordered a chili dog, one of my favorites. I watched Jack take his first bite and heard him say; “This is good!” I agree, the smoked sausage dog is a great hot dog. With hot dogs I usually eat two, but this dog with some chips and a drink makes a pretty good lunch for anybody, especially ageing men who can easily eat more than they should. Both Jack and his sweet wife Jan are health professionals and know how to eat right so he restrained himself. But I ate more than him, we had a good and memorable lunch as well as some really good conversation. I must add that I was amazed to see how the Southside area is flourishing way beyond what we think of as the “medical center”. The development of UAB and its surroundings is spreading rapidly toward downtown as well as to the east and west. 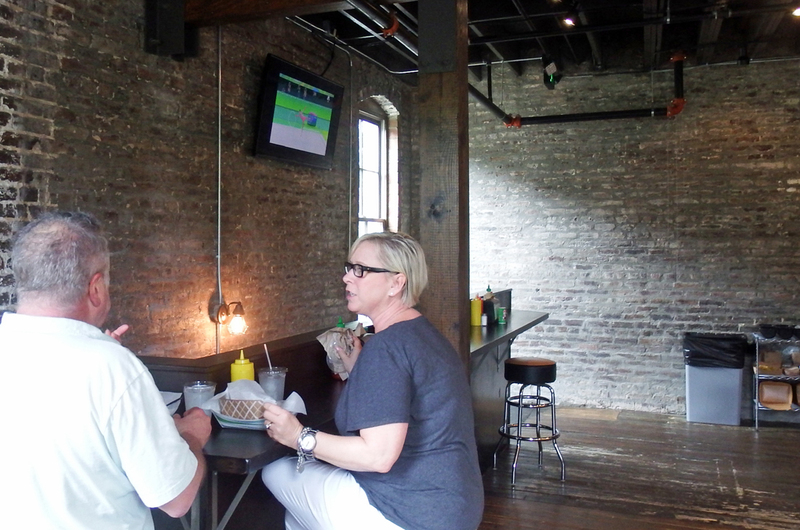 The opening of Railroad park and Regions Field have obviously helped revitalize this area. Five Points has been an active area in recent years, but there is much more going on than just Five Points. By the way, on the left is Jack who even bought my lunch! After getting him back to work I drove around a little to check out some of the downtown hot dog places. I’ll report on that soon and give a good list of current downtown servers. What's Happening to Lyric Hot Dogs? So today I am writing about Lyric Hot Dogs. On Friday Robert and I visited Lyric Hot Dogs again. More about that later, but first I want to address the great tragedy happening in our city right now and how it involves Lyric Hot Dogs. The outfit that restored the Alabama Theatre and now owns the Lyric Theatre is in the process of destroying a piece of Birmingham history so they can add a much larger lobby to the “restored?? ?” Lyric theatre. All of this is being done in the name of “restoration"; but they are moving way beyond restoration. Regarding Lyric Hot Dogs, I was startled to read a story on the al.com web site early this week. You can see that article by clicking the link here. The story is that apparently the social elite at the helm of Birmingham Landmarks, Inc. have decided that one Birmingham Landmark must be destroyed in order to make a more spacious lobby to the side of the original lobby of the “restored” Lyric theatre. 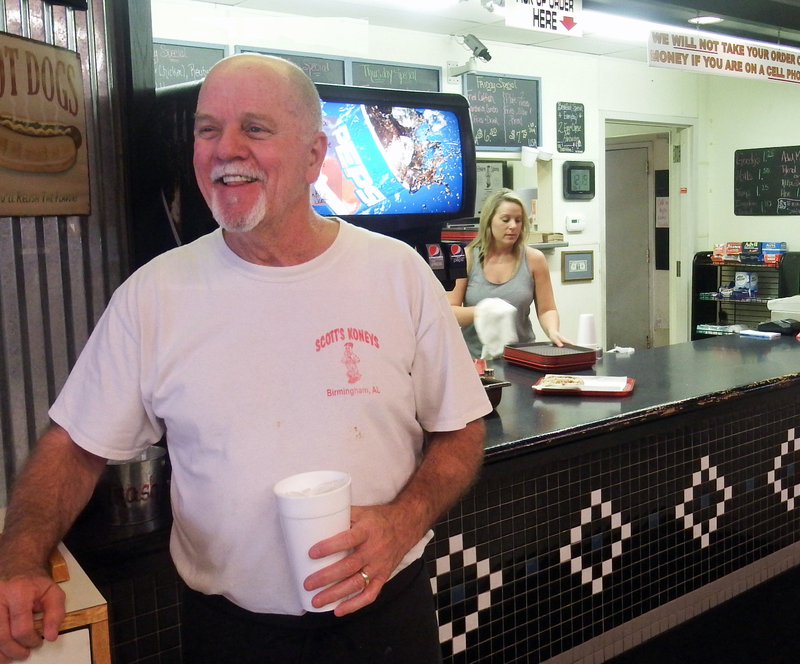 Lyric Hot Dogs is one of Birmingham’s oldest hot dog stands doing business in a particular location. We have seen many others close for good through the years; but this time the owner isn’t choosing to close up shop. 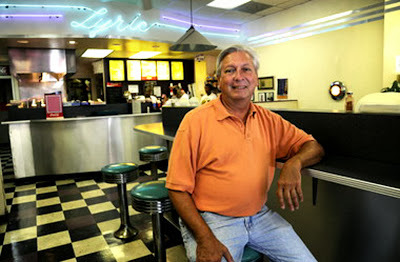 Andrew Collins, the owner of Lyric Hot Dogs, is being forced to shut his doors as he has been given until January 31, 2014 to vacate his space so that the “restoration” of the Lyric Theatre can include moving the original entrance and elevator for the office space in the Lyric Building. It doesn’t seem to bother the Birmingham Landmarks bunch that they are closing a long time Birmingham business, a landmark. It seems they really are not committed to historic continuity or the preservation of successful businesses in downtown Birmingham. The expansion of their lobby way beyond the original lobby is very important to them despite the historic nature of those being forced out. Their agenda seems to be set even though they could have easily drawn their plans to keep Lyric Hot Dogs open. I have gone to the Birmingham Landmarks web site and found the floor-plan for the new bigger and improved Lyric Theater. I am sure it will be beautiful when they are finished, but at the cost of a Birmingham icon. Maybe they think that hot dogs are just a little beneath them and would rather not have them around. Now regarding hot dogs… During the time I have been writing this blog I have been asked many times where to get the best hot dog in Birmingham. I have always given an answer that included my top five favorites at the time. I have enjoyed visiting almost every place we have visited and haven’t wanted to steer people away from most of them. I encourage people to try them all. But I must now admit that Lyric Hot Dogs has been on my list of the top five every since I first went there. This is the place to which I have taken family and friends for a visit to an authentic downtown Birmingham hot dog stand. 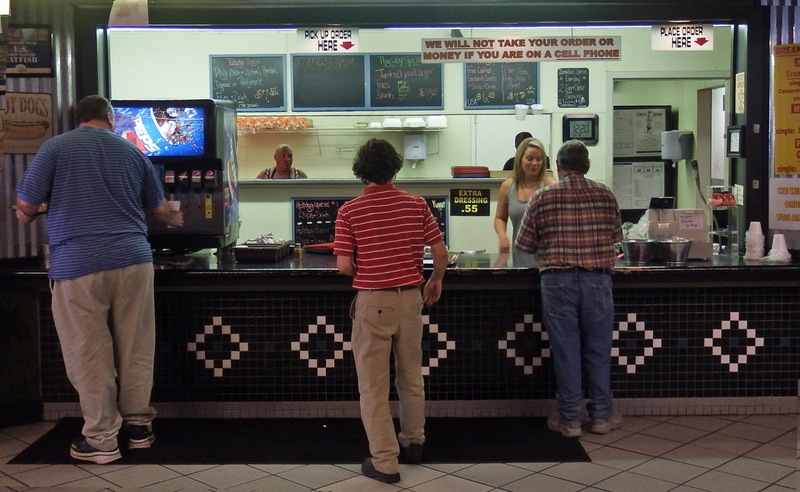 It is a consistently good server of hot dogs as well as being one of the two remaining long time locations for hot dogs in downtown Birmingham. Lyric is on 3rd Avenue North between 18th and 19th Streets, right across the street from the Alabama Theater. This is the same hot dog stand where Pete, Sam and Jimmy Graphos grew up helping their father with his hot dog business. These guys went on to start their own restaurants (Sam's Super Samwichs in Homewood, Jimmy's on Southside and the Sneaky Pete’s chain). 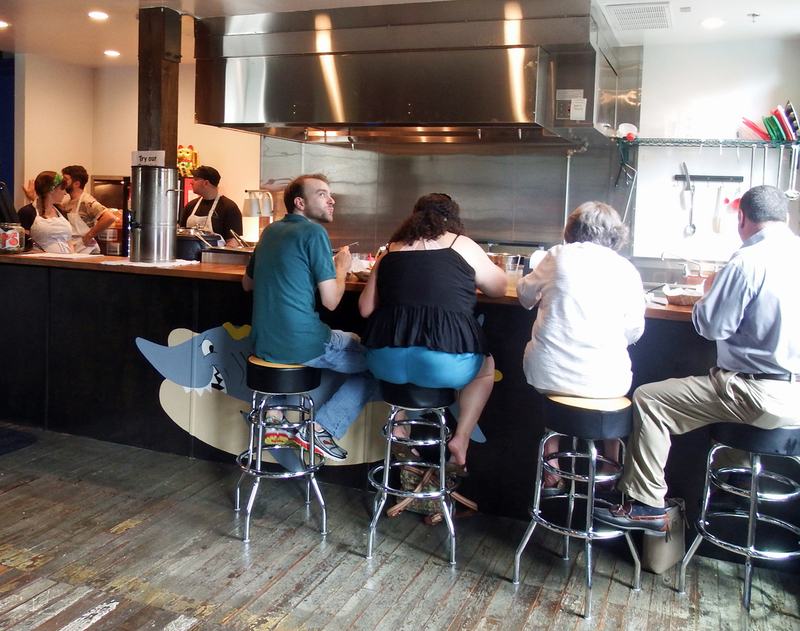 The current proprietor, Andrew Collins, is a member of their family who bought the restaurant from their father. Birmingham Landmarks sees no history here; they want a big lobby at their “restored” Lyric Theater. It doesn’t matter that in the theater’s entire history the lobby has never included this space. It’s even more tragic when one looks at the seemingly empty storefronts they own next to the Alabama theater. On this visit I was very happy to see that the place was swamped with people. Compare the two pictures below. On an earlier visit we had a wide choices of seating options, but not this time. The word has gotten out that this place is closing soon so on this trip the place was almost full of people, like us, wanting to reinforce their memories while they can. I will encourage the reader to visit the Lyric while you still can. Andrew is planning on closing well before his drop-dead date of January 31st. He says his daughter might recycle the equipment to open a place in “the suburbs”. This will be a loss to Birmingham; but I guess we are all too accustomed to losses in Birmingham. So here we were at Lyric again. We both opted for our usual order of a hot dog and a chili dog, both all the way. We sat on stools at the little counter facing the plate glass window looking out on 3rd Avenue and ate delicious hot dogs. In fact they were so good we went back for more. No weight watching that day. I think we are going to be tracking down hot dogs again. Changes in the hot dog landscape continue. Places come and go, and some move. So we will be addressing some of this.